My question back to Sandeep was, “Can you teach kindness?” I am not sure you can. This reminds me of a young woman I know, Randi, who wanted to teach her friend Barb to be kinder by paying for an expensive meal with Barb’s credit card without her being aware of it. Kind of like a joke with a lesson. Hmm, something is wrong about this picture, right? First off, Barb happened to be a very kind & caring person, so Randi was in essence trying to teach Barb to not be cheap. I told Randi that you can’t teach kindness, as it has to come from the heart. When Barb finally figured out what happened, she was disappointed and the friendship struggled for a short time. I mentioned this story to Sandeep as an example of not being able to teach kindness. However, there are ways to expose people to being kinder simply by having them experience it. 1 Hold a “Random Act of Kindness” Day every quarter, and afterward bring the company together to share their acts and how they made a difference and how the experience made them feel. 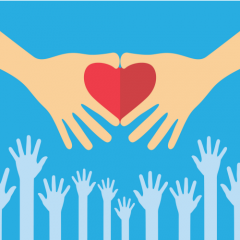 Have the company partner with a different non-profit every quarter; a number of the employees can volunteer and then be shared at the company “town hall” as well. Sandeep seemed to appreciate the feedback and mentioned he would start to implement a plan later that week. Kindness seems to be on many people’s minds these days. I was really impressed that Sandeep wanted to make his employees embrace kindness. But can you teach kindness? Or is it better to expose people to it? I find people learn best through experience. So, when was the last time you offered a random act of kindness?